April Marie Davis Campbell ’04 has been serving at Trinity Presbyterian Church in Woodbury, MN as Pastor/Head of Staff since August of 2017. She previously served as Pastor of First Presbyterian Church in Hastings, MN, Minister for Children and Families at Robbinsdale United Church of Christ in Robbinsdale, MN, and Associate Pastor at First Presbyterian Church in Stillwater, MN. 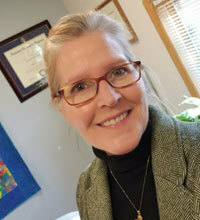 She has a BA degree from the University of Nebraska-Lincoln, a Master of Public Administration degree from the University of Nebraska-Omaha and a Doctor of Ministry degree in Christian Spirituality from Columbia Theological Seminary. Prior to attending seminary she did data and statistical analysis for the Nebraska Department of Health and Human Services Medicaid Division.